One of the most popular programming paradigms today is that of object-oriented programming. With the growing popularity of the language C++ and the advent of Java as the language of choice for the World Wide Web, object-oriented programs have taken center stage. Consequently, the past decade has seen an exponentially increasing interest within the programming language research community for providing a firm semantic basis for object-oriented constructs. Recently, there has been growing interest in studying the behavioral properties of object-oriented programs using concepts and ideas from the world of concurrent process calculi, in particular calculi with some notion of mobility. Not only do such calculi, as the well-known π-calculus by Milner, Parrow and Walker , have features like references and scoping in common with objectoriented languages; they also provide one with a rich vocabulary of reasoning techniques firmly grounded in structural operational semantics and static typing. The process calculus view has therefore proven to be advantageous in many ways for semantics and verification issues. On the one hand, the use of encodings of object-oriented languages into existing typed mobile process calculi enables formal reasoning about the correctness of programs; on the other hand, using standard techniques from concurrency theory in the setting of calculi for objects may help in reasoning about objects, e.g. by finding appropriate and mathematically tractable notions of behavioral equivalences. Encodings may also help clarify the overlap and differences of objects and processes, and suggest how to integrate them best in languages with both. The aim of the SOAP workshops is to bring together researchers working mainly in this area, but in related fields as well, where other process models or calculi are used as a basis for the semantics of objects. António Ravara and Luís Lopes. Programming and implementation issues in nonunifom TyCO. Technical report, Department of Computer Science, Faculty of Sciences, University of Porto, 4150 Porto, Portugal, 1999. 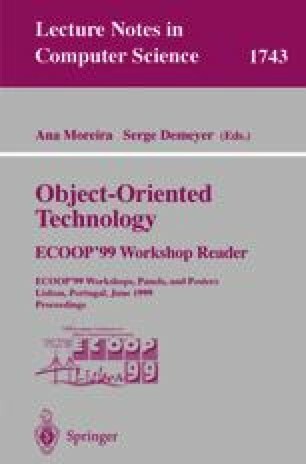 Presented at the Workshop on Object-Oriented Specification Techniques for Distributed Systems and Behaviours (OOSDS’99). Satellite event of the 1st Conference on Principles, Logics and Implementations of high-level programming languages (PLI’99). Web page: http://www.tec.informatik.uni-rostock.de/IuK/congr/oosds99/program.htm. António Ravara, Pedro Resende, and Vasco T. Vasconcelos. An algebra of behavioural types. Technical report, Section of Computer Science, Department of Mathematics, Instituto Superior Técnico, 1049-001 Lisboa, Portugal, 1999. Preliminary version presented at the 1st Workshop on Semantics of Objects as Processes (SOAP’98). Satellite event of the 25th International Colloquium on Automata, Languages and Programming (ICALP’98). Web page: http://www.cs.auc.dk/soap99/index98.html.